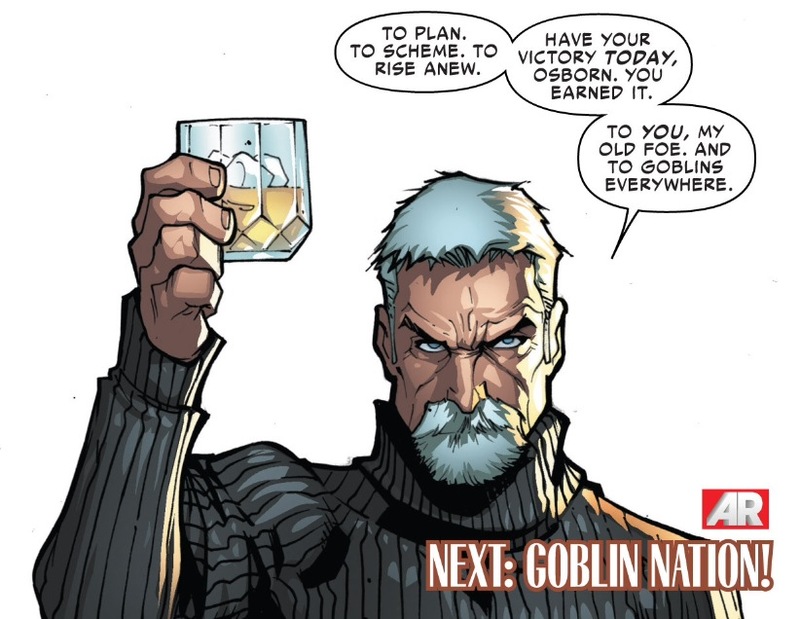 Since the general concept for “Goblin Nation” was first announced at New York Comic Con in October, the storyline has been marketed by Superior Spider-Man writer Dan Slott and Marvel editorial as the Superior-era’s magnum opus. The hype surrounding the story was ratcheted up a few more levels when we learned earlier this month that “Goblin Nation” would be transitioning into a formal “return” of Peter Parker and the Amazing Spider-Man franchise. With these factors in mind, I can’t think of a storyline in Spider-Man history where the phrase “anything can happen,” was as true as it is right now. And yet I’m having a bit of a love affair with Superior Spider-Man #26 – an official prologue issue for “Goblin Nation” – precisely for the way it steps back and moves all of the critical chess pieces into play for the next (and final?) five issues of Superior. Long-term readers of this site are probably not surprised to hear me say this, since I tend to favor Slott’s more character-grounded issues, but the way he weaves together Superior #26’s three primary narratives – Spider-Man and the Avengers, Peter and the mindscape, and the Green Goblin vs. the Hobgoblin – is just a little slice of comic book magic, resulting in what may be my favorite issue of the series thus far. What further impresses me about Superior #26 is how Slott tailors his script for three different artists in Javier Rodriguez, Marcos Martin and Humberto Ramos, who provide pencils for the respective Spider-Man/Avengers, Peter/Mindscape, and Green Goblin/Hobgoblin, sections of the issue. Having a variety of very distinct artists like these three within a single comic book issue is a tonal train-wreck waiting to happen, but Slott finds a way to play to the strengths of each artist. There’s a straightforwardness to the Spider Ock/Avengers segment (Rodriguez), a pensiveness to Peter’s chapter (Martin), and a Superior-trademark all hell breaks loose quality to the Goblin fight (Ramos). Some of the early reviews I’ve read about Superior #26 have criticized the lack of “development” in these three subplots, but I think some of these people may be focusing more on very fine details, rather than letting some of the broader thematic strokes of this issue fully mature and resonate. I understand the difficulty of absorbing less after getting a steady diet of plot-heavy comics over the past two months, but I tend to think Slott’s writing is considerably stronger when there are fewer dangling participles and loose ends for him to deal with. On the surface, the Spider-Man/Avengers arc in Superior #26 might seem like something we’ve all seen before – the Avengers pull Spider-Man aside and for the umpteenth time ask him why he’s acting so erratically. But there’s a sense of finality to this meet-up. It is impled that Tony Stark, when asking Spider Ock about the erasure of his brain scans, already knows what happened: Spider-Man is hiding something that will surely explain his bizarre behavior. 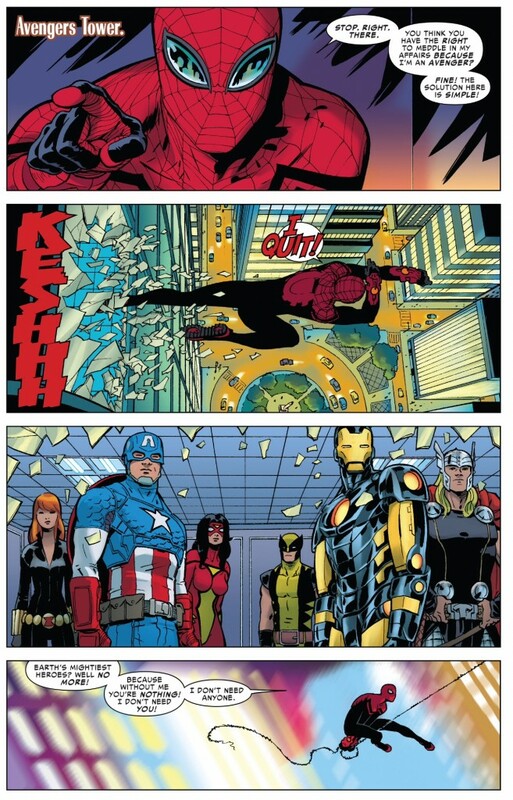 And considering how Tony is now leading the effort in trying to unearth whatever it is that’s affecting Spider-Man, I get the sense that – even without the panels in Superior #26 to explicitly spell it out –the Avengers as a whole now know for certain that something is up with Spidey and are now immersed in the process of getting to the bottom of it, with or without his cooperation. Still, the dynamic between Spider-Man and the Avengers is complicated, and I don’t fully understand the segment of the fanbase that continues to harp of the fact that the Avengers are “acting stupidly” and not “forcing” Spider Ock into confessing everything. Spider Ock himself gives a voice to these complications in Superior #26 when he mentions all of the false claims and accusations that have been levied against Spider-Man throughout the character’s history – murder, treason, petty larceny, et al. If the Avengers didn’t suspect anything then – and who’s to say that they didn’t? – why is now any different? When Stark answers, “because, for now, you’re an Avenger,” Spider Ock has found his loophole, jumping out the window of Avenger’s Tower in a fit of “you can’t fire me because I quit” hysteria, which from my vantage, makes the Avengers efforts to get to the truth even more complicated. That’s because in his actions, Spider-Man has essentially condemned himself and confirmed the team’s suspicions. But so what? What good are confirmed suspicions when there still aren’t any tangible charges to levy against Spider-Man? Having an insufferable disposition while relentlessly trying to eradicate crime by any means necessary is not a legitimate offense … or is it? 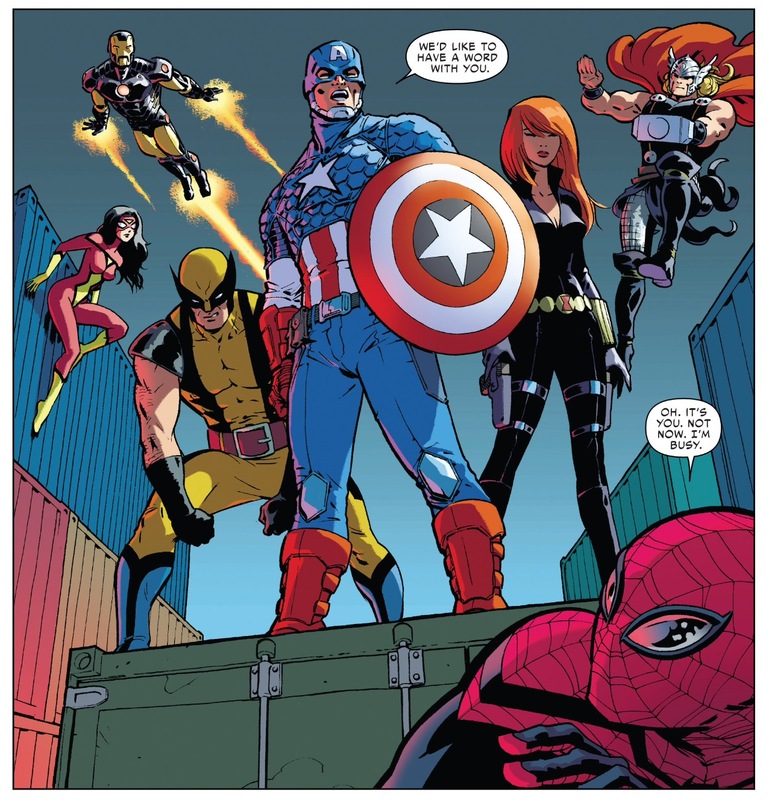 I’m not trying to put words in Slott’s mouth, but I have to think the screwed-up way our country collectively deals with what is perceived to be “right” and “wrong,” is finding its way into Superior Spider-Man via the way the Avengers view and react to Spider-Man. They can choose to act definitively on information they have assumed is true but have no way to confirm, but is that just a “two wrongs don’t make a right” solution for the Avengers? The way I’m interpreting this story is that it’s a lot easier for the Avengers to do nothing then to do something and have that be the “wrong” choice. 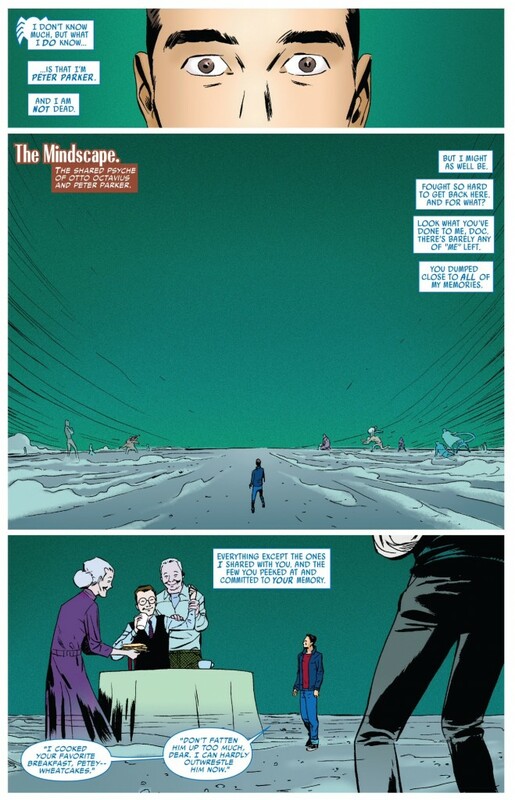 Regarding the Peter mindscape sequence, again, this is a visually and tonally familiar concept for people who have been reading Slott’s run since he kicked off “Big Time” a few years ago in ASM. Slott loves to call back to the Stan Lee/Steve Ditko days by showcasing a Peter who is filled with self-doubt, regret and guilt. Slott frequently explores the most hidden recesses of Peter’s mind, which is critical at this stage in the Superior-era, because we learn from Peter’s monologue that just a few fragments of his memory are all that he has left after Otto’s “Parker-echtomy” a few months back. Bringing in Martin for these scenes, whether it was by choice or just circumstance, was a stroke of genius on Marvel’s part. The highest compliment I can pay Martin is that he draws the way I dream. The full range of expressiveness of Martin’s Peter contrasted with the barrenness of the mindscape is just devastating to look at. I cannot think of a single comic book artist who finds a way to visually tell more story with less actual images than what Martin does here. 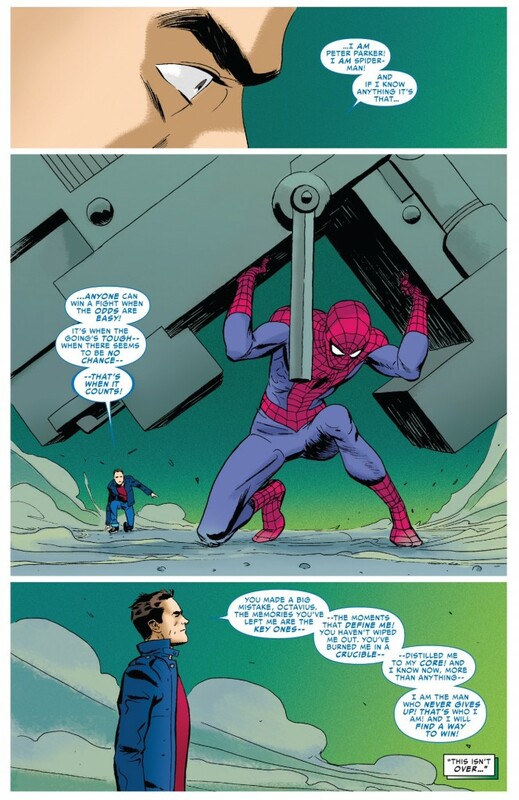 As the Peter subplot advances, Slott, who sometimes gets criticized for his “corny” writing, scripts some of his most emotionally powerful dialogue to date. Slott starts by quoting directly from the epic ASM #33, which is always a good place to start. But it gets better from there. After briefly despairing about his lost memories, Peter realizes that Otto was unable to erase the fragments that “define” him. Peter’s essence hasn’t been wiped out, but rather “burned into a crucible” and “distilled to the core.” I love Slott’s use of metaphors here, as there’s a certain call-to-arms-quality with the two he specifically chose to use. Whereas the prior appearances of “Ghost Peter” sometimes felt trite and forced, the Slott/Martin sequences read as if they were created more than a year ago to serve as a coda to Slott’s grand story. There’s a maturity and resoluteness in the way Peter speaks about his limitations and his desire to overcome adversity. This wasn’t a teaser like the image in Superior #19, or even Ghost Peter’s actions in Superior #25 – sequences that were both fun, but also read like you could blink and miss them (or in the case of Superior #19, miss it on the bottom of the page). The final Slott/Martin page is probably my very favorite in this entire series for the emotional hammer that it drops on our collective heads. 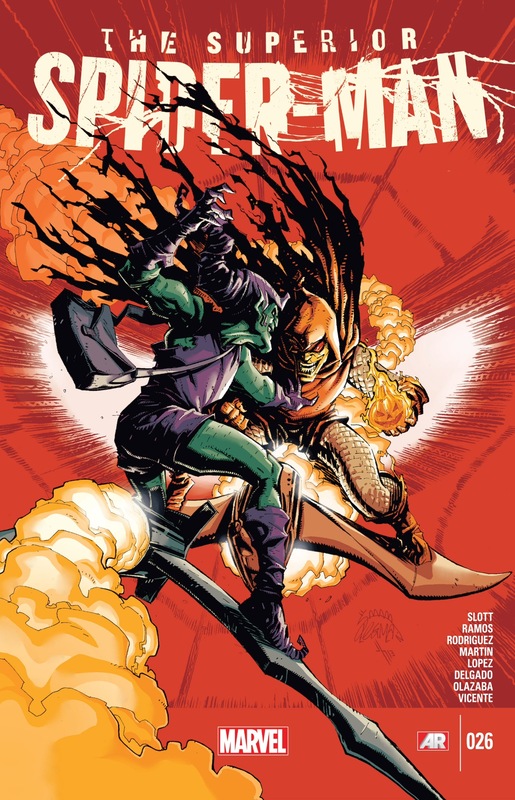 For the coup de grace, and the primary selling point of this issue, Superior #26 delivers a very well constructed Green Goblin vs. Hobgoblin battle, that satisfied me, but apparently left some people feeling a little let down by its resolution. 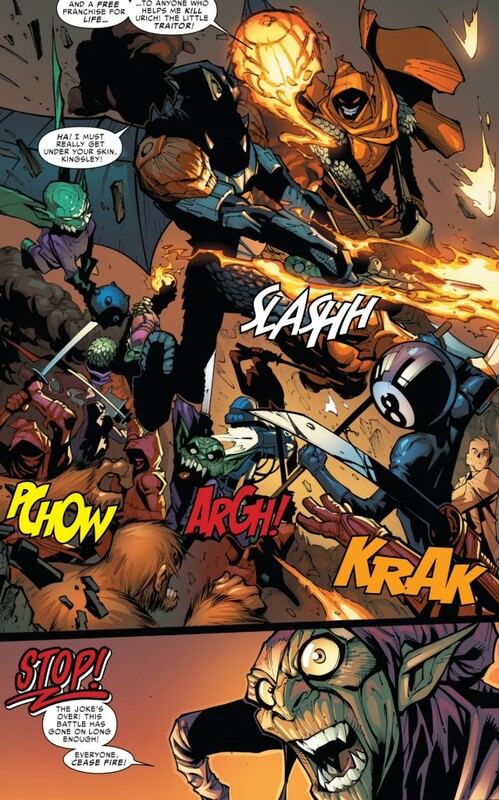 What’s funny about the Goblin battle is that the more clues we get that seem to confirm that Norman Osborn is the Green Goblin, the less likely I am to believe it. In Superior #25, he tells Carlie flat-out that he’s Norman (but refuses to take his mask off). In Superior #26, while battling the Hobgoblin (who as it turns out, is NOT the “original” Roderick Kingsley), the Green Goblin shows off the scar he acquired while getting punctured by his own Goblin Glider in ASM #122. Physical evidence of this nature seems to scream that the man under the mask is Norman, and yet, that damn mask remains on his face, keeping the mystery alive. In an effort to keep with my “I can’t speculate anymore about this stuff” promise in my Superior #25, there are three bits of Green Goblin’s dialogue that I found very intriguing in Superior #26, and naturally all have me thinking totally different things about who’s under the mask. The first is having the Goblin quote from All’s Quiet on the Western Front. This detail indicates a well-educated individual who also might identify with the idea of either being a solder, or witnessing a war/war-like atrocity first-hand. The second is the Goblin referring to the Hobgoblin as maybe being a “copy of a copy.” I HATE to go there because I know this storyline is a controversial one, but that sounds like a phrase that was mentioned a few times during the “Clone Saga” of the 90s. Is there any reason to believe the Green Goblin might have a “copy of a copy” on his mind? The last little detail is the Goblin’s reaction to Hobgoblin calling Harry Osborn a failure. The Goblin responds “how dare you speak that way about my …” and the sentence is never finished. Would Norman, who has called Harry a failure countless times in the past, act so defensively upon hearing this statement? Or is there another character out there that is related to Harry that would react so strongly? Hmm…. Regardless of who is under the Green Goblin mask, the character successfully kills the Hobgoblin, but it turns out the Hobgoblin is NOT Roderick Kingsley. 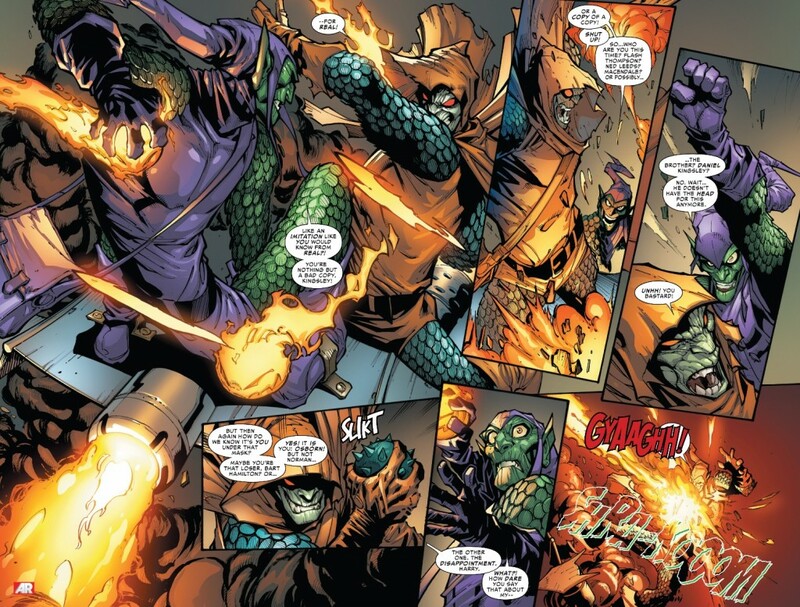 This reveal has apparently cheesed off some readers who think Slott is now portraying Kingsley as an “unkillable” character in the Spider-Man universe, but I don’t view this as a stretch or distortion of the Hobgoblin that was first created by Roger Stern in ASM #238. This idea of him manipulating and brainwashing others to do his bidding, or to pose as him, has been demonstrated in the comics on at least two other occasions in Lefty Donovan and Ned Leeds, and I’m going to assume that was the case when Roderick’s brother Daniel was killed while wearing Hobgoblin attire during “Big Time.” Beyond those specific examples, I have always perceived Kingsley as the ultimate survivor, who is not afraid to retire to the shadows while being sophisticated enough to impeccably time his return to the foreground. I don’t see that message being muddied at all with Superior #26’s ending. For Superior Spider-Talk.com’s review of this issue, click here. I’ve got a real problem with the Parker mindscape/burning him down to the crucible thing. I understand why Marvel wants to do it. It simplifies the character for the ASM relaunch. But given Slott’s love of continuity and how he’s woven in all these characters from disparate era’s over this run it really seems out of place to basically be told all that other stuff doesn’t matter. Yes those moments are what define him, but how those lessons he learned manifest themselves in the decisions he’s made matter. How he’s struggled living up to that creed in a complex universe are important. It feels really weird seeing this story coming from Slott. You see, that doesn’t bother me because the way this story has been crafted, Peter’s life as he (knew) knows it has been destroyed by Otto parading around in his body. I don’t think the past “doesn’t matter,” but Peter is going to have to rebuild everything in his life from scratch regardless – all of his critical relationships have been damaged to a significant extent. Seeing how Peter rebuilds (or doesn’t) those relationships is what I’m going to read the ASM reboot for. There’s also inherent drama in the idea that there are certain applications of his “core philosophy” that he might need to re-learn or re-experience. More importantly, what Slott is doing here reinforces the consequences of what has been done to the character. There’s not going to be a soft reboot where Peter is able to brush off the “Superior” era in a couple of issues. Considering he had his mind swapped and his memories erased, this makes sense. I do see what you’re saying and since Slott’s staying on I guess that’s the preferred way to go, but I do think that when you have a character’s memories outside of really his origin/first run being something that gives him strength that you are saying something negative about everything else. One of the things I’ve really been struggling with since the announcement is I don’t know if I want Slott to keep going. I’d almost prefer something like they did to wrap up Fraction’s Thor/Iron Man and Brubaker’s Cap run. Have a final arch about what makes the character great being why he triumphs, then allow a new creative team to come in and do something new. It’s worked amazingly with Thor: God of Thunder. And maybe that’s what Slott’s gonna do. Maybe he’s gonna build the character back up so someone else can come on without having to deal with the Superior aftermath, but I’m worried about ASM following this issue. My guess on who the Green Goblin is Normie Osborn with the ability to somehow be able to grow up into an adult body and revert back to his kid body. When he recently appeared in “Superior” # 20, that kid totally gave me the creeps. With that said, the Avengers’ reactions when Otto quit was hilariously muted. Like they just said, “Well that was annoying.” and proceeded to continue doing whatever. Couldn’t the Goblin be Norman’s OTHER grown son? Or maybe that’s still too toxic :)? After reading this book and comtemplating the return of Peter Parker and just HOW it’s gonna regard his supporting cast, I came across your first honorable mention on best Green Goblin stories and the Goblin’s Gate arc. In that arc I dont really have to remind you that Norman Osborn was noticably upset that his protege’s cover was almost blown during an outing, setting up events that could have materialized in a new Goblin arc. Well what if 15 years later we’re finally getting that story, or a similar facimile there of. Slott has a love of past continuity (mainly the 60’s-70’s era of Spidey comics) perhaps he’s going to usher in stories based off of the years I grew up reading. Perhaps this protege as another poster has suggested was a still hidden Gabriel Osborn in the Goblin’s Gate. Perhaps Gabriel is back somehow. Ah… except I believe in “Goblins at the Gate” Phil Urich was on the short list of people to be revealed as the protege…. sooooo…….. The issue feels forced and yet another attempt to totally revise the character of spiderman as he, Slott sees him. With Slott getting to mess with Spidey’s origins in Learning to crawl and getting to basically mind wipe him it’s like some even more messed up version of OMD. Speaking of that. I don’t get your love of Slott. This guy has overseen OMD and SpOck. Two of the lesser moments in Spidey’s history that make me pine for the days of the clone saga. I also feel your over analyzing this whole “looking into America’s soul” thing. This is simply a “Dark Knight” version of spiderman. It sells for sure but is it really spiderman or just a way to play to what’s popular. But hey if you are enjoying that’s cool. To each their own. I just can’t say that I am enjoying or liking it at all.